Words by Kevin Doocey on May 20, 2014 . 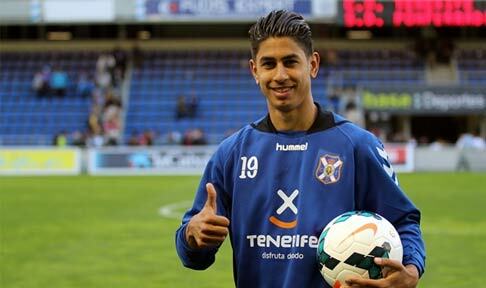 Newcastle United are reportedly close to completing a deal for young Spanish striker Ayoze Perez from CD Tenerife for a fee of €2m. The 20 year-old was rumoured to have been on Tyneside the last couple of days finalising a lengthy contract at St. James’ Park as NUFC look to kick-start their summer recruitment nice and early. I must say, I had not even heard of his name before this week so I cannot comment on what he might bring to the Newcastle setup, but in true Dennis Wise style, I watched his YouTube compilation clips and although he plays at a questionable level, some of his finishing was top notch — indeed very impressive if I may say so myself. While much of the talk about transfers has included names such as Rémy Cabella, Andros Townsend, Dmitri Payet, and even Mark Noble, it seems that Graham Carr is once again trying to unearth some promising gems, this time from sunny Spain. For those of you still wondering who on earth this guy is, there isn’t a huge amount we can say other than than he is 20 years old, has played for Tenerife all his life, and interestingly - Real Madrid were keeping tabs on his progress over the last couple of years. Any transfer dealings are welcome at Newcastle at this stage, and especially if they are exciting prospects. However, I do hope that the recruitment team will look to acquire some more experienced heads as well. We need more home-based talent on our ranks, but most importantly we need a proven creative midfielder (Cabella) and an accomplished goalscorer. Ayoze - as he likes to be called - is one for the future, I just hope that Newcastle do not see him as the finished solution to our goal-scoring issues. The reality is Loic Rémy is off to Arsenal, Shola Ameobi will leave when his contract expires at the end of June, Luuk de Jong has been brutal and has returned to Germany, and Papiss Cissé is out for the considerable future. To say we need a number of new forwards is an understatement. Anyway, if there are any Tenerife fans reading this, or indeed Segunda Division aficionados then feel free to fill the rest of us in on what Ayoze would bring to St. James’ Park. Be sure to follows yours truly on Twitter @KevinDoocey too. Ayoze Perez is tipped to be the next Fernando Torres.. he has real pace and can turn very quickly with the ball at his feet taking out defenders out of the equation in a split second. He has good dribbling skills as well and good anticipator about when and where the ball might end up in the box. However, he is not yet the polished product and will be good in a back up role this season. With more premiership games under his belt, he would be a force to reckon with. We still need the proven No.9 as it stands to spearhead the attack and one who can drive fear into the hearts of the opposition defenders. Tipped to be the next *young* Fernando Torres circa 2008, right? !